Latvian services have been held at Rowfant since 1953, when the London Latvian Lutheran Church first started to lease Rowfant House. Later the church purchased Rowfant House from the Locker-Lampson family, and subsequently Rowfant House Ltd was set up as a registered charity to own and run Rowfant House on behalf of the Latvian Lutheran Church in Great Britain. Jane Locker-Lampson, a particularly religious family member of an earlier generation, had converted one of the rooms of Rowfant House into a chapel, and the Latvians continued to use it as such. Pastor Roberts Slokenbergs held the first Latvian service there on 29th November, 1953. 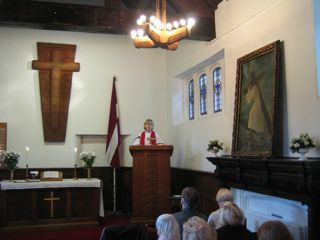 Since then, changes have been made to the chapel which have enhanced its Latvian identity. The pulpit, the great wooden cross behind the altar, the font, and the chandeliers are the work of a Latvian sculptor, Zigfrīds Sapiets. The stained glass windows, installed in 2003-4, are the work of Ilga Dripe. On one side are four windows that symbolize four seasons and festivals of the church year: Christmas, Easter, Whitsun and the Harvest Festival. On the other side, above a cupboard that contains cremation caskets, are two windows with the first and last letters of the Greek alphabet, alpha and omega. The accompanying texts are Latvian versions of “I am the resurrection and the life. He who believes in me will live, even though he dies” (Jn 11:25) and “I am the Alpha and the Omega, the First and the Last, the Beginning and the End” (Rev 22:13). The Chapel is no longer used by the Latvian congregation.